Did you know you can now order your Deliveroo takeaway from Sushi 54 here on View? Sushi 54 is a Japanese restaurant offering delicious meals with an impressive selection of drinks where you can eat in, take away or have it delivered. Do you work at Sushi 54? What did you think of Sushi 54? Wonderful fresh sushi, with a wide variety of choice. The restaurant is small and they do not serve tables on Friday's since this is mostly a delivery business. The service is fast and friendly, the prices reasonable. Overall it is very highly recommended. Like some of the comments below. Great food but a really rude manager. No reason as to why they couldn't switch one of makis in the set menu. Also sat in the corner on the left on the really nice japanese style tale...until there were loads of ants crawling around us and we had to move. No compensation for any of this either, barely even a sorry. But still good food. so very tasty. I have been eating here for just over a year now. It's just the most perfect and freshest food in town. All the ingredients are of a high quality. My favourite is the somen noodle salad which has such clean flavours . I also love their tempura particularly the soft shell crab and the baby squid which comes with delicious pickled seaweed and cucumber. Their tuna tempura roll is so addictive with its sweet chilli sauce. There are so many items on their menu that I just love. 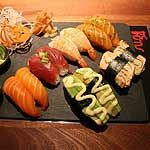 Sitting outside at the front in the summer with a nice cold Kirin and the best Sushi in the south west! supposed to be 5 stars not 3!! so very tasty. I have been eating here for just over a year now. It's just the most perfect and freshest food in town. All the ingredients are of a high quality. My favourite is the somen noodle salad which has such clean flavours . I also love their tempura particularly the soft shell crab and the baby squid which comes with delicious pickled seaweed and cucumber. Their tuna tempura roll is so addictive with its sweet chilli sauce. There are so many items on their menu that I just love. Sitting outside at the front in the summer with a nice cold Kirin and the best Sushi in the south west!! The above poster gives journos a bad name-Sushi 54 is lovely and if you don't like the two teeny chicken gyoza just don't eat them-there is loads more in the box. I suggest this journalist go after the numerous disgusting, dirty and horrible restaurants in London and leave this lovely, delicious clean sushi place alone. Here, here to freedom of choice-the right to refuse to serve people like this. The best sushi place I have eaten in-gorgeous food, clean lovely restaurant, lovely service, yum yum-go there Im a fuss pot and I love it. Sushi 54 was an excellent meal on the first night of a perfect weekend. The staff were friendly and helpful, and the food was great! We had a takeaway, and chose to walk around to pick it up. The price was average, but excellent for the quality of the sushi!! Fresh and flavoursome! It's true that they don't swap things into their boxes, but we got around that by ordering the things we wanted that weren't in the box seperately. I'd warn everybody that the portions are large! You don't want to spend more than you need to, and we were surprised at how large they were and only just managed to eat it all... we had a Mini set, a Half and half and an extra prawn nigiri, and both of us were stuffed! All in all, a superb choice! This place was excellent, very fresh fish and perfect rice, big maki pieces! Not too expensive either. Strongly recommended! I had an awesome meal delivered from Sushi 54 the other day. They have cracked the way to deliver sushi and make it nice. Salmon Skin Maki, Eel Nigiri and Chicken Gyoza are 'non-negotiable' items in any order now. They say on the menu that they don't accept substitutions for items on the set boxes and they don't unless you're eating there and you're very nice to them - so get over it. They missed out on 5 stars as the Prawn udon soup noodle tasted excellent but could have used a bit of fresh vegetable in there. Always room for improvement. Just ordered takeaway from Sushi 54, and felt compelled to review it. I ordered the 14 piece salmon set, and I was astounded by the quality and amount for £11.50. Now, this isn't bargain basement for a lunch, but it's not far off for sushi. The salmon was excellent, some of the best I've had, and it was all very generously cut - the sashimi across the whole fillet, the nigiri draped so that each piece was as much fish as rice, both very good signs. It was also beautifully presented, which is tricky for takeaway but they managed it with style.Service was swift, if a bit mumbly and joyless, but it's all about the fish, and this was simply superb. I will be back, and I'll take friends with me. I adore sushi and have eaten here many times since it opened, I go time and time again because it is absolutely delicious! The fish is always fresh and is it so beautifully presented you almost can't bear to ruin it! The menu is extensive and everytime I go, I try and have something new with a few of the old favourites thrown in. The chicken gyozas must be tried, they are served with a special gyoza sauce and a light chilli oil, dip in the oil first then the sauce, mmmm yum! My mouth is just watering thinking about it! 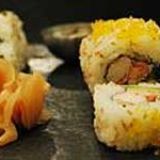 Other favourites include marinated salmon nigiri, the mexican futo maki roll with melted mozza, salmon and jalapenos - delicious. I recently tried the vegetable soba noodle salad which was really fresh and refreshing, the soups are also really good, my favourite is the tiger prawn one. The spicy tuna is delicious, as well as the seared tuna with a more-ish sauce that I always end up drinking it's so good... everything is yummy to be honest! If you haven't been already, you really must go, you won't be disapointed! This is a great Sushi bar. The staff are friendly and most importantly the sushi is fantastic. The fish is much fresher than I've tasted elsewhere - I was really impressed by the attention to detail. Highly recommended, especially since their delivery service is so good as well. Finally a local sushi restaurant in Putney that serves quality food, has a very relaxed ambience and delivers. Just what this area needed. I never write these type of reviews but I really felt compelled to speak this restaurants praises. I recently went to try out this new Sushi restaurant and I was very impressed by the menu and the service I received. The price for the quality of food was very reasonable and I was very intrigued by the combination of traditional sushi dishes with alternative outlooks to sushi. I recommend trying the mexican futo maki. It is absolutely divine!!!!! Took my girlfriend to sushi 54 to start her birthday night out coz she loves sushi. I was never that much of a fan but I am a very good and considerate boyfriend! I might have to change my mind about sushi though coz this place was so much better than I expected. GF ordered for us and we had mixed sashimi. It was unbelievable. I even, after telling the waitress I didn't like sushi when we ordered, halfway through got her back and made her get me some more tuna sashimi NOW, which made her laugh! Anyway, the whole meal came to £32 for the both of us with beers and everything. Oh, and some japanese coleslaw thingy too. Really good value I thought, which is more than I can say for the dive of a club we ended up in later on. How can you charge over a tenner to get into a club in Putney of all places? Won't say the name of the place, but it rhymes with "the bez club". Anyway, back to the sushi restaurant. I'm gonna try the delievery service this weekend - hope it's as good as the place itself. Lovely people who obviously cared about what we thought, great food, and lots of lovely brownie points for me from my better half. Job done. If you're a fan of sushi then this is one place that should certainly cater for your needs. My first time visiting there but I will certainly be back! The menu has a modern twist as well as the more original versions of ushi faves like Nigiri, Sashimi and even new variations that work well. The meu's big and I'd definitely recommend the soba noodle salad. The service is swift and efficient. Only small criticism I'd make is that the restaurant itself isn't in central London so you need to get the bus out to Putney if you're not a local. But don't let that put you off. I find it's well worth the journey. Some of the best sushi I have had in London! Blink and you’ll miss it along the busy Lower Richmond Road, this diminutive sushi spot in London’s southwest is worth seeking out. With a bright white modern decor enhanced by delicate oriental touches, the interior is fresh, clean and welcoming. There are only a couple of tables, although you can choose to perch at an elegant high bench or be a full-blown Japanese epicure and cross your legs, fluff the cushions and sit at the authentic knee-high dark-wood table in the secluded side room. If you want to mix sushi with sunshine (weather permitting! ), there are a few tables lining the window outside under the black canopy emblazoned with the scarlet Sushi 54 logo. With space for no more than about twenty seated patrons, Sushi 54 has an intimate and relaxed atmosphere. The staff are exceedingly friendly and ever helpful – flitting between attending the few tables and manning the counter at the front where there is a steady stream of customers ducking in to pick up their takeaway sushi feasts. Those after a buzzing, lively restaurant should look elsewhere but it’s great if you’re out to enjoy your own company. The menu is enormous – while the sheer size of the offering could raise concerns about quality at restaurants of other cuisines, here the copious choices for fresh and delicious sushi are a plus for connoisseurs. Look to the Top 10 sets if you need a nudge when ordering – here you’ll find sets of maki, nigiri and sashimi organised into various serving sizes, from about £6 for the mini up to about £30 for a large bento, designed for sharing. The small bento is a great choice for one, including two nigiri (sizeable mounds of sticky rice draped with equally sized tender, succulent pieces of salmon and tuna, spiced up with a dash of wasabi), four slivers of fresh salmon and tuna sashimi and two perfectly browned gyoza – irresistibly plump dumplings stuffed with a savoury minced chicken or vegetable filling. With the bento boxes you also get a dose of the light and moreish miso soup, perfect with soft tofu squares and crunchy spring onions, as well as extra rice. If you’re more inclined to tailor-make your order, there’s tons of sushi combinations available. 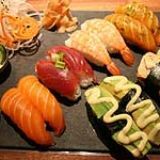 The choices of nigiri and maki sushi include traditional fillings like cucumber, avocado, salmon or tuna alongside the more unusual eel, octopus, oshinko (yellow pickled radish) or the salty tobiko (flying fish roe). There are also noodles, soups and salads. A tiger prawn tempura is very pricey at about £8 for three pieces but the prawns are sizeable and coated in an airy, lightly oiled, crispy batter that will leave you wanting to dole out for more. For something a little different, try the Mexican futomaki – a large rice roll stuffed with salmon, mozzarella and jalapenos that is superbly spicy and savoury. It’s not commonplace to follow a sushi smorgasbord with a rich dessert but the homemade brownie with green tea ice cream is a spongy, gooey delight perfectly contrasted by the refreshing sorbet on the side. All the food at Sushi 54 is beautifully presented, delicately arranged on crisply white plates – a visual feast as well as a tasty one. Sushi is typically best when paired with a crisp white wine and there are a few decent tipples on offer that perfectly suit, starting from £13.50. The dry and delicate Marlborough Summerhouse Sauvignon Blanc is ideal with fish, although there is a French rose and a few reds as well. Beer-wise there are Japanese stalwarts Kirin Ichiban, Asahi and Sapporo and sake is also on offer. If you’re having a teetotal evening, there are five varieties of green tea or jasmine tea, plus the usual soft drinks. Mixing traditional favourites with some more off-the-wall combinations, Sushi 54 promises something delicious and unique for sushi fans. The steepish prices won’t lure fans of the cheaper sushi chains but if you’re willing to pay a little extra for a more refined atmosphere and better, fresher food, then 54 is your number.